In a small bowl mix sugar, vinegar, Tabasco hot sauce, salt, pepper, dried Parsley, and canola oil. Whisk until completely combined. 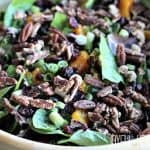 Place fresh spring mix salad in a large bowl.